Subscribe below to receive your FREE GUIDE, along with farm updates, tutorials, inspiration, recipes and more! 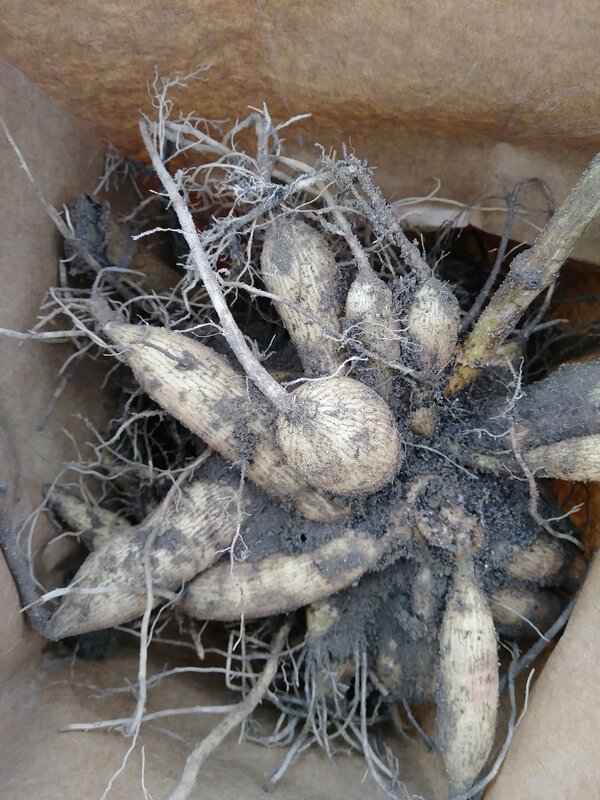 This time of year, I receive countless questions about digging and storing dahlia tubers. There is so much conflicting advice and uncertainly. Some people start to panic! I get it. Tubers are a big investment and of course, you want to do everything you can to ensure your tubers survive over the winter. 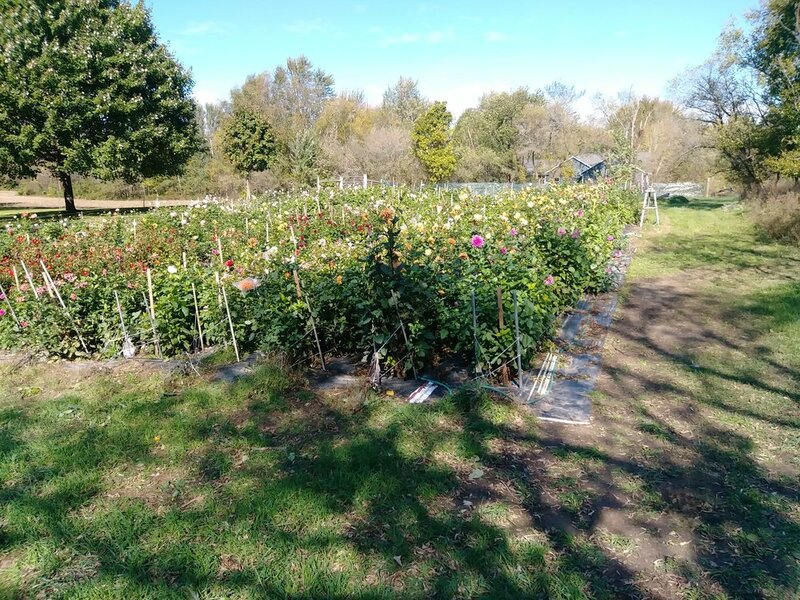 I’m going to walk you through the process we use for digging and storing our dahlia tubers. After reading and watching the videos, you should feel more confident and ready to try it on your own! 1. There are several different methods that can be used to store dahlia tubers. When you hear “seemingly contradicting” advice, just know that different methods work for different storage situations. The way WE store them might not be best for YOU, since we don’t have the exact same storage spots. 2. If you are new to storing dahlia tubers, I highly recommend you try a few different storage methods and locations. This will help you discover the ideal methods for YOU. It’s never a great idea to “put all your eggs in one basket”. This way, if one method is a flop, you have a back up supply of tubers. So, first… here’s a quick video that shows you what dahlia tubers clumps should look like AFTER you dig them up. Notice the big clump of tubers and the short stem. Ok, now that you know what you’re going for and what the tubers look like, let’s get digging! Digging and Storing Your Dahlia Tubers. P.S. Frost covered dahlias are gorgeous, but they only look pretty for about an hour and then they turn to mush. Get out there and take photos! It only happens once a year! Happy Frostmas! “Black Satin” after the first frost. BEFORE: Dahlia field the day before the 1st frost. AFTER: Dahlia field the day after the 1st frost. These photos were taken within 24 hours of each other! 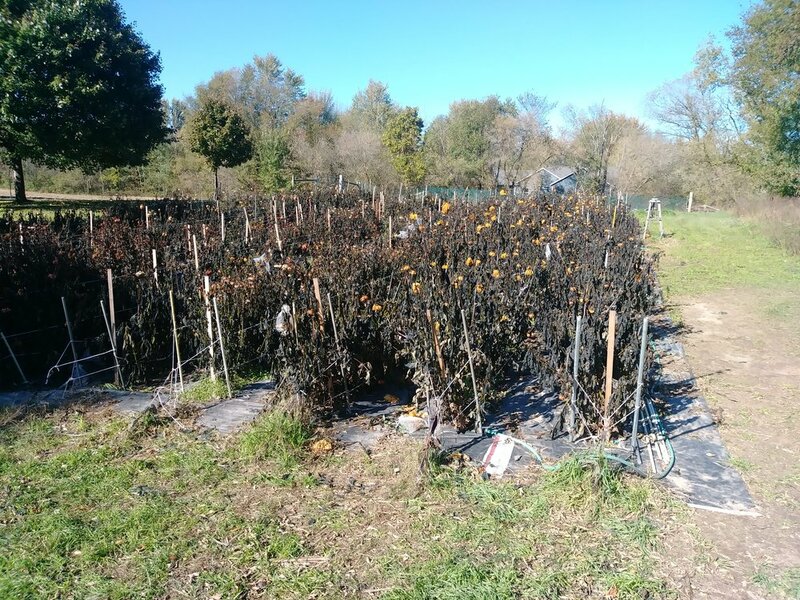 Once the frost has killed the plants, go through with a heavy clippers or loppers and cut back the main stem and all the foliage, leaving a “stem handle” sticking up out of the ground about 4-6” long. Once you have cut back the plants, it’s time to WAIT. You can relax for a week or two. Simply leave the tuber clumps in the ground, undisturbed. Cutting back like this signals the tubers below the ground to set “eye” (sprouts) on the tubers. This is important, because you need to be able to see the eyes if you plan on dividing your tuber clumps right away. Cutting back also signals the tubers to cure and toughen up, which helps them store better over the winter. 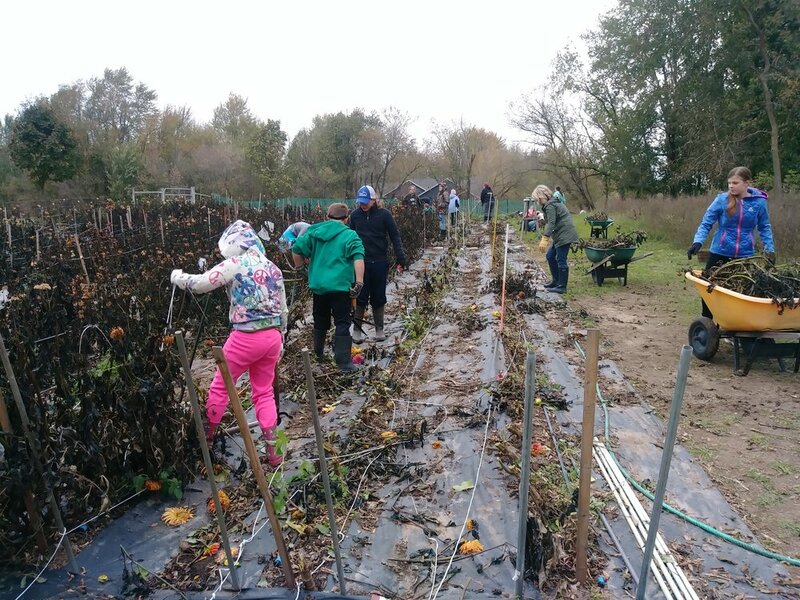 We made “Cut Back the Plants” day into a work party and cut back the whole field in 1 hour! Step 3: Time to Dig! After 1 -2 weeks of curing in the ground, you can begin digging. Using a pitchfork, CAREFULLY loosen the soil on all sides of the tuber clump. Take care to NOT break the tubers. They are EXTREMELY fragile. Do NOT yank up the tuber clump by the “stem handle.” Instead, place one hand on the handle and use the other hand to pry up the clump with the pitchfork. Gently remove excess soil from around the tubers with a pencil, stick or paint brush. Clip off “root hairs” and any broken tubers. Using a loppers or heavy clippers, cut off the “stem handle” near the base of the clump, leaving about 1-2 inches. Do NOT cut too low or you will cut off the “eyes”! Place the clump in a bag or crate with the dahlia variety name clearly marked on it. Bring the bags/crates to a cool, dry location out of direct sunlight (like a garage or covered porch) and allow them to dry for about a week. A nice looking dahlia tuber clump! Will you divide your clumps now or in the spring? We usually divide in the spring (we simply don’t have time to deal with them in the fall! ), so we store our tubers in clumps. We feel keeping the clumps whole as long as possible helps the tubers to store better… but obviously, it takes up waaaaaay more room than storing individual tubers. If you do decide to divide in the fall, you will need to do a little more babysitting over the winter. Wash clumps and allow them to dry overnight… or simply brush off excess dirt with a paintbrush (this works best for light sandy soil. If you grow in heavy clay, you will need to wash them). Divide the clumps into individual tubers (watch the video below to learn how). Allow cut ends on tubers to dry and cure, about 2-3 days. Remember: ONLY tubers with “eyes” are viable! Store tubers in bins/boxes filled with vermiculite, peat moss, or wood shavings. Be sure that they are not touching each other! Fill the bin with about 1-2 inches of storage material and carefully place the tubers so they are not touching. Sprinkle another 2 inches of storage material on top and add another layer of tubers, and so on. They can also be wrapped in newspaper to prevent touching. Store at 40-50 degrees Fahrenheit, with about 70% humidity. Leave clumps unwashed. Brush off as much dirt as possible. Store in boxes/plastic or paper bags/crates at 40-50 degrees Fahrenheit, with about 70% humidity. If you are storing in a dry place, plastic bags may work best. If you are storing in a damp place, paper bags may work best. Tubers in a paper bag ready for winter storage. THIS IS THE TRICKIEST PART OF GROWING DAHLIAS. Dahlias are relatively easy to grow, but proper winter storage can be a struggle! Here are a few tips for storing your tubers over the winter, regardless if they are divided or not. Store at 40-50 degrees Fahrenheit. If the tubers freeze, they will turn to mush when they thaw. If they get too warm, they will rot. Humidity at about 70%. Ensure that the tubers are not too dry (they will shrivel) and not too wet (they will rot). If your space is dry, you can control this by storing in plastic bins/bags and occasionally spritzing with water. If your space is damp, try storing in paper bags/cardboard boxes that will help absorb moisture. Peat moss, wood shavings and vermiculite will also help regulate humidity. In extreme cases, you may need to run a dehumidifier or a humidifier, depending on your needs. Check on your tubers every few weeks. Remove any rotted, mushy tubers and discard. Mush is no good. 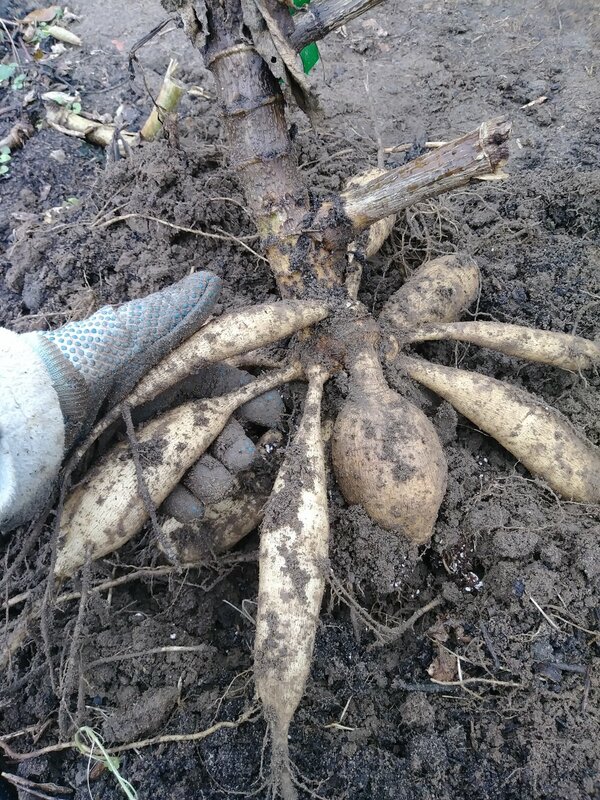 If the tubers looks shriveled and dry, don’t toss them - move them to a more humid location. I’ve seen the most terrible dead-looking tubers come back to life in the spring. Sometimes the tubers develop small amount of mold. Don’t panic. It means your spot is too humid. Move them to a drier spot and simply brush off or wipe off the mold. Thanks for taking the time to read this. I know, it’s a lot of overwhelming information and some of you are wondering if it’s worth all the time and effort. And maybe now you understand why dahlia blooms cost more than most other flowers! They are a real labor of love! You don’t HAVE to dig up your tubers every fall. Some people simply decide to purchase new tubers every spring and that is fine! If you are on our email list, you’ll be the first to know when we have dahlia tubers available in the late winter/early spring. You also can try experimenting with “overwintering” you tubers in the ground, depending on where you live. Here in Zone 5b in the Great White North (Michigan), dahlias will not survive over the winter, but… let me tell you what happened to us last year! We had several “Blizzard” variety dahlias that we did not need to dig up (because each plant produces about 20+ new tubers!) so we left them in the ground. Our neighbors gave us huge loads of maple leaves and they ended up in a giant heap (2-3 feet deep) over the dahlias. We meant to move them but didn’t get around to it before the snow came. Come spring, I lifted up that thick layer of leaves… and found a dozen healthy dahlia plants sprouting! We transplanted them and they did GREAT this season. So, it IS possible to overwinter them, but it might have been a fluke. Have fun digging your tubers!